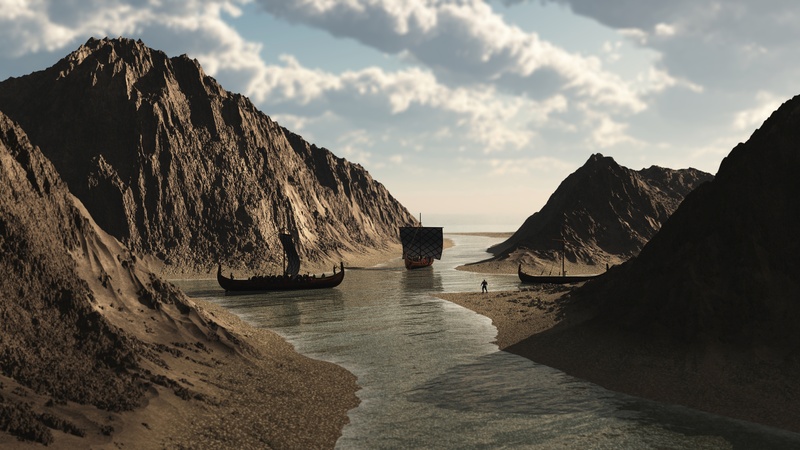 Sagas are essentially stories, some were legendary but mostly about ancient Nordic and Germanic history, around or about the early Viking Age and their voyages, the battles that took place during those voyages including the Viking expansion migration to Iceland as well as of feuds between Icelandic families. They were written in the Old Norse language, mainly in Iceland. The texts are tales in prose which share some similarities with the epic, often with stanzas or whole poems in alliterative verse embedded in the text, of heroic deeds of days long gone, "tales of worthy men," who were often Vikings, sometimes heathen whilst at other times within a Christian context. The term saga originates from the Norse saga (pl. sögur), or "story, tale, history". It is cognate with the English word saw (as in old saw), and the German Sage. Icelandic sagas are based on oral traditions and much research has focused on what is real and what is fiction within each tale. The accuracy of the sagas is often hotly disputed. Most of the manuscripts in which the sagas are preserved were taken to Denmark and Sweden in the 17th century, but later returned to Iceland. The Icelandic Saga Database is an online resource dedicated to the digital publication of the Sagas of the Icelanders -- a large body of medieval literature which forms the foundation of the Icelandic literary tradition. 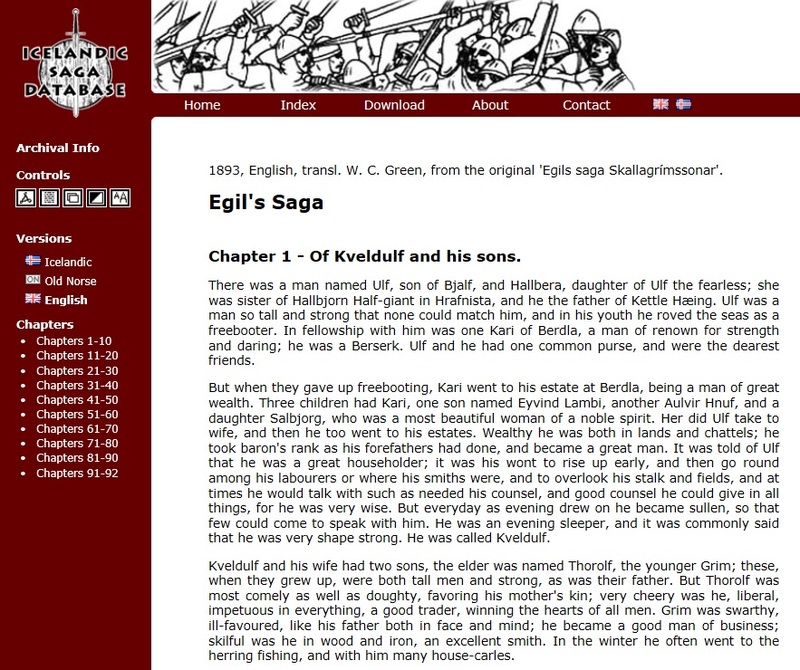 This website contains all the extant Icelandic family sagas in an easily readable format using modernized Icelandic spelling, with Old Norse versions and translations into English and other languages made available where these exist in the public domain.The Icelandic sagas are prose histories describing events that took place amongst the Norse and Celtic inhabitants of Iceland during the period of the Icelandic Commonwealth in the 10th and 11th centuries AD. They were most likely written in the thirteenth and fourteenth centuries AD, perhaps originating in an oral tradition of storytelling. While their facticity and authorship is for the most part unknown, they are a widely recognized gem of world literature thanks to their sparse, succinct prose style and balanced storytelling. The sagas focus largely on history, especially genealogical and family history, and reflect the struggles and conflicts that arose amongst the second and third generations of Norse settlers in medieval Iceland, which was in this time a remote, decentralised society with a rich legal tradition but no organized executive power. 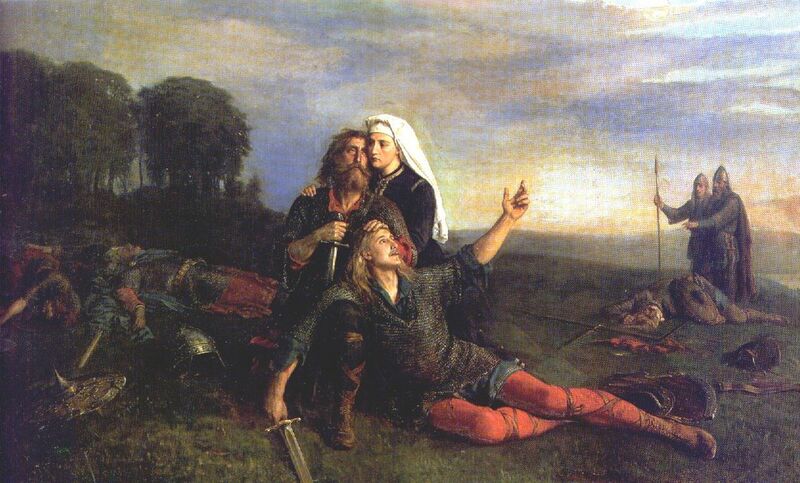 Fornalder ("times past"); painting by Peter Nicolai Arbo Peter Nicolai (June 18, 1831 – October 14, 1892) was a Norwegian historical painter, who specialized in painting motifs from Norwegian history and images from Norse mythology. A legendary saga or fornaldarsaga means literally, the story/history of the ancient era. Legendary sagas are Norse saga that, unlike the Icelanders' sagas, takes place before the colonization of Iceland. There are some exceptions, such as Yngvars saga víðförla, which takes place in the 11th century. The sagas were probably all written in Iceland, from about the middle of the 13th century to about 1400, although it is possible that some may be of a later date such as Hrólfs saga kraka.